When Will I Get My Single Fold Newsletters? 5,000 and under Single Fold Newsletters: Ships or ready for pick up in 2 business days from proof approval. Over 5,000 Single Fold Newsletters: Ships or ready for pick up in 5 business days from proof approval. When it comes to single fold newsletter printing, 48HourPrint.com is singled out as one of the best! Our convenient online newsletter printing services deliver high quality single fold newsletter printing at prices you can really afford. And you also get the benefit of our industry-leading 48 Hour Turnaround Time Guarantee for quantities of 5,000 or fewer newsletters. 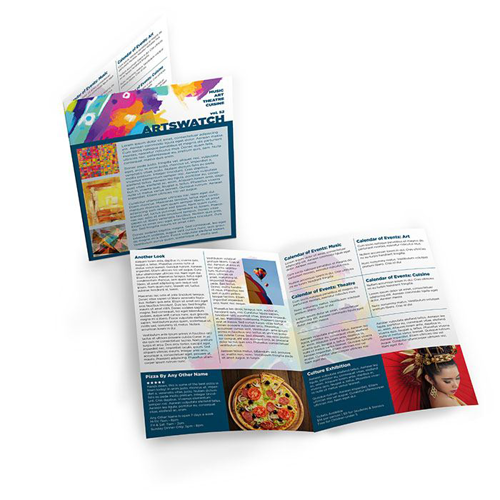 Single fold newsletter printing is a powerful and cost-effective way to connect with your target audience. Draw readers in with a full-color layout and captivating articles. Graphics, photos and splashes of color make your single fold newsletter inviting and something readers will look forward to receiving. Single fold newsletter printing is the standard for many organizations and these newsletters can be easily mailed or distributed. In addition to our single fold newsletter printing services, you can also choose from no fold newsletter printing, tri-fold newsletter printing, double parallel fold newsletter printing, accordion fold newsletter printing, french fold newsletter printing, roll fold newsletter printing and gate fold newsletter printing. We have newsletters covered!